You’re waiting for your dentist appointment. They’re running behind schedule and you’ve run out of Instagram photos to flip through. Want to check the stats on your last Tweet? Don’t wait until you’re back at your desk. 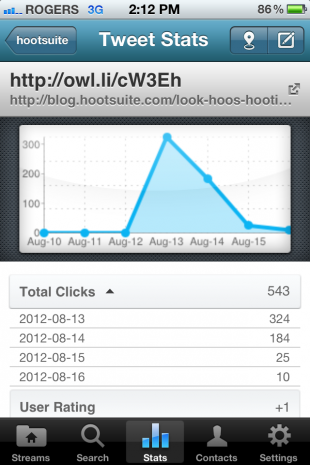 Check quick stats while you’re out with your HootSuite Mobile App. Now that you’re connecting with social networks on-the-go, explore your tweets’ influence with quick analytics for HootSuite Mobile Apps. Don’t miss out on sunshine tied to your desk — monitor your analytics right from your phone! In just a tap, find out which Tweets were most effective by checking out their unique quick stats graph. Why not use analytics to experiment with your social networks? Switch up your social messaging by substituting keywords and changing the tone. Each Tweet will have its own easily accessible and informative graph based on your owly link from which you can monitor its social influence. From there, find out which style of Tweet connects best with your following. Check out your Tweet’s number of clicks per day easily, by tapping the total clicks arrow icon. Notice that certain days resonate more with your following? Depending on your followers, certain times of day and days of the week may be more popular. For example, are you social messaging for your business? Try tweeting during peak business hours and track your results by total clicks. Messaging for your band? Experiment with tweets in the evenings and on weekends — perhaps you have a late night following. Track your analytic graphs for future tweets’ best results. On vacation? Queue up similar tweets but schedule them for different times and days of the week based on your peak viewing trends from previous mobile stats. Schedule a variety of tweets and check out their stats while you’re away. 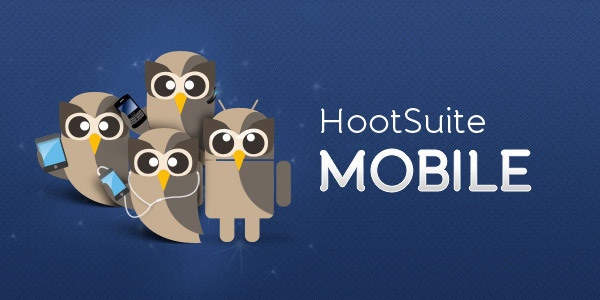 Find your optimal tweet with HootSuite mobile’s quick analytics. Want to dive deeper into your social analytics? Discover a world of analytics in the HootSuite social media management system.